I have purchased this product from mobile fun previously. Our kitchen is under socketed where we have space to dump phones etc. for charging; these new charging sockets have eliminated the pile of different dedicated chargers and their tangled entrails, without the need to install new sockets. Galaxy, Blackberry, Cello pad, Fit-bit and Motorola Modo 5. I sit back and enjoy peace. I have peace it's very rare. Bought this gizzmo for my wife who always wants to recharge the mobile,the iPad the kindle....you name it it's got to be plugged in. Well this little beast let's her do 2 things at once and when I get my prize I will buy her another . I need more power points for my various gadgets, which I seem to be collecting. This surge-protected multi-charger is ideal and takes up no more space than a ordinary single charger. I would definitely recommend this. Sturdy build and good overall feel to the product. Does what it says and also the size is good as doesnt get in the way of other plug. The power lights are quite bright so if you want a dark room then this will be a bit annoying. Im not sure why it needs that size and brightness of light just to tell you the power is on. All in all worth the buy if you need charging ports. I bought the first of these well over a year ago for my own use & found it so useful and convenient that I have subsequently bought more for all my family & grandchildren. I can simultaneously charge a laptop, iPad & iPhone from one socket. Reading about the Masterplug,and wishing many times that such an item, would be extremely useful, I decided to invest in one. Without any exaggeration, I have only had the plug a few days, and already the practicality of it just makes sense. In a domestic scene, one is usually using a mains outlet very frequently, and of course the necessity of mains outlets in a kitchen goes without saying. This plug is one of the most useful and must have items for every household! You can leave it plugged in all the time and still are able to use the socket for other uses. Only negative is it can get hot when switched on for log periods of time. Great charger with night light. Great for taking with you when travelling. Can charge iPhone and iPad at same time together with electric toothbrush and bright night light when in hotel room without disturbing partner by putting on main light. This little gadget is simple yet effective. Works a treat... no problems. Excellent,will be very handy on holidays in particular. It is a pity that you cannot get to the socket switch whilst in situ. I am really pleased with this product. I like that it has a light up indicator to let me know that it is working correctly. I like the fact that it can charge multi devices at the same time. I feel confident using it because it has the surge protect on it, and on top of all that it looks good. I can truthfully say that I cannot find any negatives. It does the job perfectly. Only takes up one socket when you are charging two items. It is nice and compact and fits into any room in the house, without looking like a sore thumb ! It is well made and stylish. Comes in white or Black. Delivered quickly and well packaged, thank you. This is compact but totally effective. Two fit a double socket and there is room to reach switches. However you can also split the double pack between two rooms, thereby powering more devices. Really satisfied with this purchase and would definitely recommend to friends and family. I have found this unit very useful,I took this on holiday and found it very good to use ,charging both my wife's phone and mine at the same time while still boiling the all important kettle.Brill! it gives you 2 USB charging options and a surge protected mains plug, whats not to like? The device is very slow to charge. If I am using my iPad whilst plugged in the % of charge reduces! When using both USB ports with iPad and iPhone with proper Apple cables, I keep getting the message on my iPhone "This device may not be supported" and it immediately stops charging. I definitely wouldn't advise buying - very sad as I bought a twin pack! Does what it says- charges 2 USB devices & still provices 3 pin plug access. The only thing I would say, is that my devices charge very slowly using this plug- whereas charging direct into power is faster.However, you do have the advantage of multi use of a power socket and also you have an important surge protection for your devices. Third one i have bought. This one for kitchen. Charges my phone and electric cigarette together with no worries about surges. Also handy to still have plug available. Fabulous product. Mega quick delivery. One happy customer. Useful Product - albeit "bright"
This product does what it says it does - however i planned to use it in a bedroom to charge up iPhone / iPad etc. the LEDs on the front of the unit light up the whole room at night and there is no way to disable them, Its been relegated to the kitchen. Great product, as well as being surge protected I can now charge my mobile phone and another device, all at the same point. Very handy piece of equipment with 2 charging points and place for a 3 pin plug. Very slow charging but I would rather it be this way than to fast and blow the phone/tablet. Overall quite pleased and, because I had the twin pack, very good value. Really pleased with this charger plug. It has a power serge function. Very handy for charging more than on device. Have bought quite a few things from mobilefun, this device saves carrying plugs for your phone or ipad. Having used it on my travels, i would say its a very useful product. Brilliant gadget, my partner and I have one each beside our bedside tables. Now we can each plug in our mobiles and electric cigarettes together still leaving sockets for bedside lights, hairdryer, etc etc. Super fast delivery too. A really neat bit of kit that solves the problem of USB charging multiple devices. Now have one in my touring caravan which helps keep things tidy. Also allows me to easily check when successfully connected to mains hook-up as the pilot lights come on! We wanted to charge two devices at once without tying up a socket, and this has been the ideal solution. We tried a powered USB hub, but it didn't supply the current required. This unit charges any combination of mobiles and tablets as fast as their original chargers. At MobileFun's discount price this is excellent value, and we're very pleased. This works a treat, charges phone and tablet at the same time with the anti surge/spike security. Great service and delivery, do not hesitate to buy from this company. I wanted this to take on holiday. It is neat, light and protects your devices from erratic foreign electricity supplies. Just what I wanted to replace our rather bulky and heavy former gismo which also had a very bright light that kept us awake. So far it's impossible to evaluate the anti-surge protection, and hopefully it will stay that way. Faith is a wonderful thing, and so I will trust it to work it it gets the surge. That said the device is s useful compact pass through plug. The two USP outputs have meant that now one socket can do the work of three, and in my cluttered life this is a veritable plus. Worth the money, especially the twin pack. I bought two to give one as a present, but thought long and hard before deciding to parcel it up, and not keep both for myself. This is an excellent charger, but I have only given it 4 stars because the indicator lights are really really bright and as I have this in my bedroom beside my bed it is really annoying so I have to find a way of covering them up. I wish I knew how to switch them off or at least down, then I would have given it 5 stars. Apart from this it is a good charger. Many thanks for sending the device so promptly and painlessly. It's an ideal gift for the house because everyone can use it - now I shall have to purchase some more!! They say the simple ideas are the best. We bought this device, because of the limited number of electrical sockets, in accommodation, when travelling with a number of electrical gadgets. I have purchased many products from Mobile Fun,this has to be the most useful, get rid of plug city with this practical device. This is my second Masterplug I've bought this one for my daughter. It is so versatile two USBs and a straight through socket all at the same time also it is cheaper than an Apple charger plug. The only downside are its lights they are very bright try not to use it in a bedroom at night it may keep you awake. I have charged an I-phone and an I-pad at the same time and the plug does not overheat top class bit of kit recommend this to everyone. Whenever I decide to charge phone or I-pad someone always wants to use the plug for something and I return to find someone has unplugged my charger so they can use the plug ! This gets over the problem, I can charge my devices and they can use plug at same time and the fact that I can charge 2 devices at the same time makes it quicker as well ! The concept is good, the product works fine. I was dissappointed it has bright indicator lights on the front, white if in use, blue if socket is empty. I wanted to use this in the bedroom so I could keep my lamp plugged in while charging my phone (alarm clock). The lights are too bright. This master plug was tested yesterday and supported the charging USB leads. A friend used the 3 pin socket outlet without me hogging the wall socket. Two happy people, one happy customer, thanks. The USB ports are 1A, great for phones but tablets require a little more power to charge especially iPads. A useful charger allowing for a 13amp connection as well as two USB ones.Spoilt by the very bright indicator lights.One looks like an on/off switch which it is not.They spoil a good product,but still useful. Just as advertised, although didn't realise it would light up like a Christmas tree when plugged in! However no real problem as I can always cover lights with tape . I brought this plug for the caravan , having limited power plugs this gizmo is brilliant I can charge two phones or tablet and phone and not loose any socket spaces , I didn't buy one I brought the twinpack to give me twice the options , don't have to worry now about looking around for charging plugs , it's a must if you have limited power sockets . What a brilliant idea. Not too large and enables you to use the socket and charge 2 USB devices. Looks good quality and a neat design with a nice glow at night. Great! As well as being useful in the home this will save my taking two chargers with me when I'm travelling - and I don't have to sacrifice the bedside lamp in a hotel room! 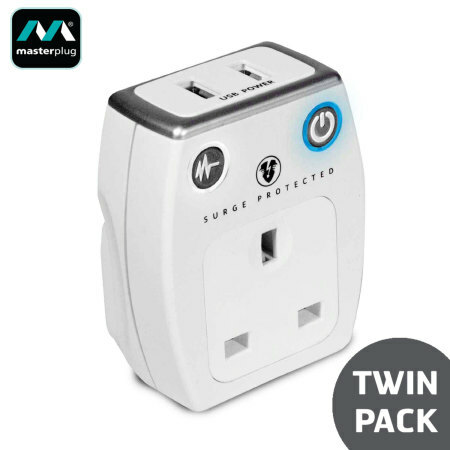 I was considering buying a double 13A socket plate with a pair of USB 'A' sockets but came across this gadget - 2 for the same osrt of price -so I bought a twin pack. Glad I did because I can now take these chargers anywhere, charge teo devices simultaneously and still have a free 13A socket. If you're even considering something like this buy it! SUperb!! these are so good---I have them everywhere and sent them to my son. My worry was that charging Apple devices seems to be a bit hit & miss but this works with all my Apple cables, it also means that the kids don't need to unplug my stuff to charge theirs! Charging is via two standard USB plugs. It charges a mobile phone via a standard USB lead to mini USB . It is similar to an ordinary charger, but as the advantage ou Surge protection. Love mobile fun as you get very good service off them they are always reliable if you buy something that's out of stock they keep you well informed of when they expect the product to be back in stock ..I really recommend shopping with mobile fun ! The Three pin plug out let combined with 2 USB is so useful , so much so that I have ordered more and for my son also. Before i got this product I was forever looking for a charger and spare plug socket. Now there is no need always plugged and ready the bonus of anti-surge protection is very satisfying for peace of mind. In fact I bought 2. My iPad cannot be charged by either my laptop or my PC, so naturally when I tried this little chappie out and realised I could not only charge my iPhone but my iPad at the same time, I was absolutely made up. This charger is a great way to reduce tha trailing wires when charging an ever increasing number of mobile appliances. I was considering the replacement socket plate but this is easier to fit, portable between rooms (or houses) and better value in my opinion. Usual efficient delivery from MobileFun! The "surge protection" and "power" lights are very bright! I will use some electrical tape cover them to dim them as undimmed, they light up the bedroom at night! Once again a happy customer! It does exactly what you want it to! It can charge 2 USB devices and a mains plug simultaneously and is surge protected too. It also looks stylish with the 2 lights it has on the front. I boughht 2 of these and straight away my daughter "pinched" one A really handy bit of kit. Lots of gadgets plugged in around the house and yhis little gem allows me to free up a couple of sockets. Great! This is a really handy way of charging devices. My iPhone and iPad get a lot of use and require frequent charging. Previously I charged them seperately but it is so convenient to charge them together. handy when charging both my wife's and my mobiles. I thoroughly recommend this product.